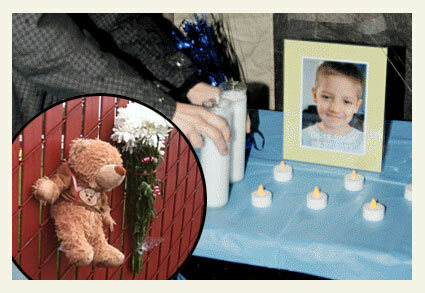 A memorial held for Jordan Ryan near his kindergarten building. UPDATE 10/17/13: It was reported today in the Baker City Herald that a Baker County grand jury declined to indict Mary Lane, the owner of the pit bull that brutally mauled to death 5-year old Jordan Ryan on September 27. District Attorney Matt Shirtcliff announced the grand jury's decision Thursday morning. According to a press release from Shirtcliff's office, the grand jury "reviewed the case and has determined that there is insufficient evidence to support criminal charges." Baker City Police investigated the background of the pit bull, which Lane had owned for about a month and a half before the deadly attack. Police did not find any evidence the dog had acted aggressively "toward people. "1 Lane acquired the dog from an unnamed John Day resident, previous news reports called the animal a "rescue pit." Neither the previous owner nor other John Day residents who had been around the dog, had seen it act aggressively, according to police. No mention was made in the article if Lane's household had one or two pit bulls (or more). Back when we posted the 10/08/13 update -- to shake the tree and see if any nuts fall out -- there was another photo of Bentley from July 29 playing tug-of-war with another large dog. This photo has since been removed from the Pitbulls of Oregon Facebook group, possibly because it is not too glamorizing. At this time, we do not know if Bentley or "Taz" is the culprit in the deadly attack. On Friday, DogsBite.org will submit questions to the district attorney's office to clarify this issue. On Thursday, Michelle Ryan, the mother of Jordan Ryan, spoke to KTVB. She said she brought her three children over to a friend's house that morning who volunteered to watch them while she was at work. While the two moms were chatting in the kitchen, one of her children ran in and alerted them to the attack. Ryan said someone screamed for her to call 911. While on the phone with the 911 operator, she rushed to the back door and saw her 5-year old son badly injured. Paramedics lost Jordan Ryan's heartbeat on the way to the hospital. Michelle Ryan said she has taken her children over to the woman's house before and never had a problem, however, she said she did not know her friend had "recently adopted a new pit bull." Ryan said the "worst case scenario did come true." She said she does not know how she will "pick up the pieces and put on a face to where people can think that I'm okay even though I'm dying inside." Ryan told KTVB the case is still under investigation and she has not heard from police. On Friday, the Baker City Herald published an editorial piece (City action on pit bulls is necessary), as well as an update regarding possible criminal charges. District Attorney Matt Chirtcliff said he expects to decide next week whether to file criminal charges in connection to the death of Jordan Ryan. The Record-Courier published an article about the most recent Baker County Council meeting that formed a committee to research the "pit bull" and dangerous dog issue further. 10/09/13: A Second Pit Bull? Commenter Sylvanna Martin of Baker City2 left several messages at DogsBite tonight providing information that may or may not be true, we have no way to verify. Given the disturbing "hush hush" about the violent pit bull mauling death of Jordan Ryan by police authorities and parents of children at Ryan's school, -- Where is the outrage? -- we dove into Facebook and undertook the detective work we could. Our main objective: Shake the tree and see if any nuts fall out. Sylvanna Martin proved to be an interesting nut. Martin claims that Bentley the pit bull (posted in photos below) is not the attacking pit bull. She wrote in part, "The pit you have pictured is one the family has had since a puppy and would easily pass a Canine Good Citizen test! He is well mannered and socialized, the exact opposite of the culprit. The pit responsible for this terrible incident and put down, was named Taz..." It gets better too; Martin apparently does not understand the concept of "moderated comments" on a blog. In Martin's first attempt to leave a comment, she reveals more: "The pit that was put down and responsible for this accident was named Taz and was a black and white pit bull!!! She didn't even have him long enough to get pictures of him!" If this is true, Martin doesn't realize that this is exactly the nut we hoped would fall out of the tree: Information directly damning the pit bull rescue group that placed Taz out. "She didn't even have him long enough to get pictures of him!" Martin successfully upped the ante against the still unnamed pit bull rescue group and did not do the owner or keeper of the pit bull, Mary Lane, any favors either. The following statement implies that people knew Taz was dangerous and certainly should not have ever been in the vicinity of children -- there were possibly up to 8 children3 at Lane's home that Friday morning: "He is well mannered and socialized, the exact opposite of the culprit." Thanks for the share Martin! The father of Daxton Borchardt is following this attack on his new Tumblr blog, Father of Dax. KTVB.com reported a follow up story on Tuesday and interviewed Autumn Brooks, a friend of Jordan Ryan's family and the owner of the pit bull, Mary Lane. Brooks said the pit bull involved in the attack was from a rescue program, but did not name the program. To reiterate, approximately a 10-month old pit bull placed into a home with five children killed a young boy visiting the home on September 27. Police authorities still have not released many details about the deadly attack. A memorial service was held for Jordan Ryan on Tuesday in Baker City. Friends and family set up a GoFundMe page to help the boy's family pay for funeral costs. Penny Pankey states in the About area: "Jordan left his family and friends in a very cruel, horrifying attack on this Friday morning as he was playing in the babysitter’s yard with his 2 siblings. A "Rescue" Pit Bull mauled him to death." Pankey added that the funeral costs are $3,600 and must be paid in 30-days. According to Mary Lane, the owner of the dog that killed a 5-year old boy last Friday, her pit bull named Bentley is under 1-year of age. In photos posted from September of this year, Bentley was only 9-months old. 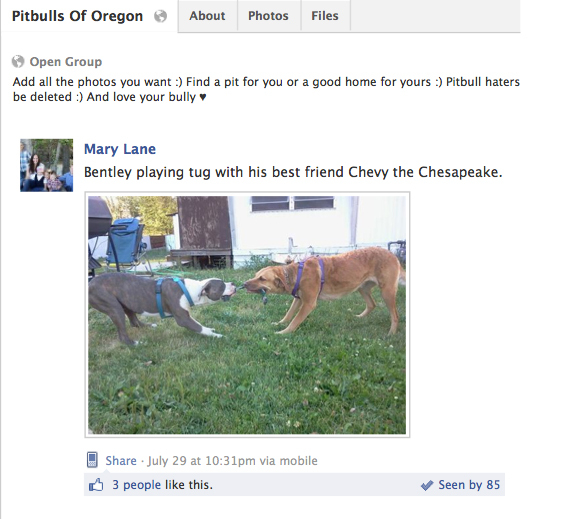 Lane posted the photos to the open Facebook group Pitbulls of Oregon. Her male pit bull is unleashed in what appears to be a public park or lake area playing with some of Lane's five children. "Love this boy!" and "My Bentley!" Lane exudes about her beloved pit bull. This seemingly family-loving young pit bull brutally mauled to death an innocent boy staying at Mary Lane's home about 2-weeks later. How does Lane feel now? Why has only one media outlet even reported her name? There's more to Lane of course, her two favorite TV shows, according to her Facebook page are: Pit Bulls and Parolees and Pit Boss. Various page "Likes" include: Loyal Pit Bull Fans, Pitbull Lovers, I Love Pit Bulls, Pit Bulls and Itty Pitties -- readers get the picture. Clearly, Lane believed the appalling disinformation about this dog breed and now a child is dead. The Record-Courier, a weekly in the county, reported on Saturday that Jordan Ryan was mauled to death by a pit bull at the home of Mary Lane of 1947 14th Street in Baker City. Grief-counseling services for teachers and students were provided by the Baker City School District in the days following the boy's death. The school district also sent a letter to parents with condolences to the Ryan family and all of those affected by his death and explained their crisis response actions. On Friday, the Baker City Herald published two editorials by area residents, each demanding that the community ban pit bulls. Steve Culley was alarmed that, "There doesn’t seem to be an overwhelming outrage over the pit bull death of a young boy." Raymond Reinks points out the inexcusable "comments in defense of the breed" after the death of a child and "no expression of remorse," both extreme breed advocacy traits explained in Essay of a Fatal Pit Bull Mauling. On Sunday night, about 150 residents gathered in Baker City to remember 5-year old Jordan Ryan who was struck down by a pit bull on Friday, September 27. The group released a bundle of bright balloons into the darkening sky. Children were heard echoing, "Bye Jordan," as they floated upward. After they disappeared into the night, someone began singing Amazing Grace and everyone else joined in. The gathering was held outside of the kindergarten that Jordan attended. “We have the memories,” said Hank King, Jordan’s great-grandfather. King led the group in prayer and comforted the boy’s grieving father, Nathan Craig, his own grandson. Jordan’s mother, Michelle Ryan, also attended the memorial. It was a cold, wet night. A small tent was set up to allow close relatives a place to grieve, sheltered from the rain, and to keep a table with the boy's photo surrounded by candles dry. Next the to tent was a red fence that served as a memory wall, where people hung flowers, stuffed animals, balloons and ribbons. In a statement released today, District Attorney Matt Shirtcliff said the boy "suffered extensive injuries, which caused him to bleed to death" after being attacked by a pit bull on Friday in the 1900 block of 14th street. "As a result of the incident the dog will be euthanized," states the release. After the police investigation is complete, "I will review the case for potential criminal charges, or determine whether the case needs to be presented to the grand jury,” stated Shirtcliff. Baker City police have released the name of a young boy mauled to death by a pit bull in Baker City on Friday. Jordan Michael Ryan, 5, of Baker City was at a friend’s residence between 9 am and 10 am when the fatal pit bull attack occurred, Police Chief Wyn Lohner said Saturday. Lohner said he anticipates more information to be available about the fatal dog mauling on Monday. A memorial will be held Sunday night for Jordan in front of the kindergarten he attended. 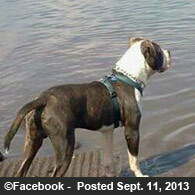 New information has been reported about the most recent pit bull fatality in Baker City. School Superintendent Walt Wegener confirmed that a dog attack took the kindergartner's life on Friday. "He was dropped off for babysitting and ended up being taken to the hospital where he was pronounced dead in the middle of the morning," Wegener said. The school district has a four-days a week schedule for students, which is why the child was with a babysitter on Friday. Though Baker City police haven't released many details about the fatal attack, they did say the attack occurred at a home in the city (not the child's) and a pit bull was involved. The sheriff's office also told KTVB that the dog was impounded after the attack. Wegener believes police will release more information to the media "whenever police are ready." Wegener said that school staff members have been notified and counselors will be ready at the schools on Monday. Baker, OR - The Baker City Herald reported tonight that a 5-year old boy died after being attacked by a pit bull this morning, according to District Attorney Matt Shirtclift. "The dog is in custody and is no further threat at this time," said Police Chief Wyn Lohner. The attack did not occur at the child's home, according to the article. The investigation into the most recent U.S. fatal pit bull mauling is continuing. The names of the deceased child and the dog's owner have not been released. 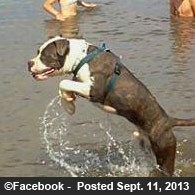 September 27, 2013 marks the third U.S. pit bull fatality in the last five days. 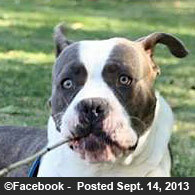 On September 22, a 2-year old boy was killed by his babysitter's pit bulls in Gilbert, Arizona. The following day, 2-year old Samuel Zamudio was killed by a group of pit bulls owned by his grandmother while being babysat at her home in Colton, California. Of the 23 fatal dog attacks so far this year, pit bulls and their mixes are responsible for 83%, a sharp increase from the combined 8-year total of 60%. 1"Toward people" is not quoted in the Baker City Herald article, thus we do not believe it was part of the actual news release. Rather it was the writer's translation. DogsBite.org will request a copy of the district attorney's news release on Friday. 2It appears Sylvanna Martin is a boxer breeder (LJK boxers) in Baker City and a Facebook friend of Mary Lane. 3The owner of the dog, Mary Lane has five children. The GoFundMe memorial campaign stated that Jordan and his two siblings were "playing" at her residence at the time of the fatal attack. 4Prior to this, two categories were tracked: 1.) attacks involving a "watcher," such as a grandparent or babysitter watching the child and 2.) attacks occurring within two months of the person or dog being new to the household. 5We continue to track both scenarios. So far in 2013, 27% of all fatality victims involved a "watcher" scenario, primarily by babysitters, all victims were children 8-years and younger. This is the 100th US Pit Bull DBRF since President Obama took office 4.6 years ago. It took President Bush almost 8 years to hit the 100 Piticide mark. No others have come close. Congratulations Mr. President! Once again I had to look twice at this page to make sure I was seeing a new post. I just can not believe it. Three children killed this week while at the babysitters. And yet there seems to be no tipping point as to when enough is going to be enough with pit bulls. I just have to say, I am a bit puzzled that so little media attention has been given to this child's murder. I don't think of this as an "accident", because having pit bulls around children is a calculated risk that adults take. Why is there NO information about the dog or it's owner? If a child is hit and killed by a car, the driver is named. Why are the police withholding this information? Why aren't members of the community sharing this information? Maybe by making the details public, someone will come forward with information relative to the investigation, like whether or not the dog has bitten before. There are no details given on the dog, either….who owns it, how old is it, how long has the owner had it? Did it come from a rescue group who told the adopter it was friendly? It seems like the local authorities and media are protecting the dog owner. Congratulations to longstanding Texas Governor Rick Perry for recently governing over his 32nd Pit Bull DBRF! Texas has a prohibition against BSL, so always remember "BSL doesn't work for dog fighters, pit bull breeders and Pit Bull Rescues!" Wake up America! Get Rid of those Demon possessed Dogs. Get them out of your homes! Get them away from your Families! Get them out of your cities! Get them out of your country! Get them out of this world! God help you all! That Oregon pit group has lots of photos of children being used as props to show off their mutants (some with nuts) – some kids are using them as pillows – where have we heard that before? They were cooing over ugly Bentley earlier. The silence is deafening now that he killed a child. Is Lane an animal abuser now that her pittie-poo flexed his DNA? More than likely they will imagine up something along the lines of the child taunting the ultimate nanny. Just weeks before this dog killed a child, Mary Lane posted pictures of him, off leash, in a public park, with children. Some rescue group adopted out this dangerous dog to a fast food worker,(whose employment credits include McDonalds and Taco Time) a single mother of five small children. Not one person in the community seems to care that this was a completely preventable death, and that other children are at risk because this rescue group will continue to adopt out dangerous dogs to people like Mary Lane. This attack has troubled me, because of the complete lack of outrage coming from the Baker City community, with the exception of a few individuals who had the courage to write letters to the editor. I cannot believe that the friends, neighbors, classmates parents, friends and family of the victim, do not demand to know where the dog came from, and will not make that information public. There may be someone out there who adopted a pit bull from this same group, who is ignoring behavioral red flags, and who is setting the stage for another child's death. Maybe finding out that the same group that told them their dog was safe, adopted out a child killer, would wake them up and convince them to get rid of the dog. If this happened in my local elementary school, it would take me all of 24 hours to find that information, whether or not I knew the child. These rescue groups are literally murdering children, and there is not one shred of public outrage. This child died a horrible, violent, terrifying, agonizing death….he was torn apart by a vicious animal. And I am sure that, as I type this, the individual who adopted out Bentley, is right now trying to find a home for yet another pit bull who "just loves kids", and who may end up mauling or killing another child. So, to the folks in Baker City…. have your memorials for this poor, dead child, light candles, say prayers, sing kumbaya….but, for God's sake, don't demean his short life by calling this an accident and walking away. You can prevent this from happening to another child by exposing the group responsible for placing that killer dog. Been wondering the very same thing about these rescue organizations. I believe that animal planet would protect Tia Torres to the end of the earth if her dogs are killing people, as if there have been reports and they were made public, pit bulls and parolees would not be such a cute show after all. Anything like that shouldn't even be on the air. They are peddling danger and getting away with it. There is absolutely no way on earth she has handled and passed along this money pit bulls and not the responsible for maulings, maimings disfigurements and death. Wouldn't it be amazing if a pro pit group paid for the childs funeral. I am not holding my breath. This was no accident. It is predictable. This dog flexed its genetics while still a puppy. If that does not wake people up to the monster that lurks inside this breed, I do not think anything will. Bravo Branwynne, well said as usual. Like Darla Napora, the owner was a nutter who learned the truth in the ugliest possible way. Thank you for posting the photos of the killer pit–it will be quite difficult for nutters to claim that thing is a Lab or a Chihuahua. I went to the effort to see the pic, and Yep! Pretty much. Great idea to bring another dog into this mix, oh and a breed of dog not known-even to nutters- to get along with other dogs. That information should take the word "accident" off of anyones lips. God what a hideous, evil-looking dog. I will not be nominating her for any Parent of the Year awards, but I don't think her employment in fast food restaurants is germane. It's hard work and an honest living (that doesn't pay a living wage). Point well taken, Miss Margo….I think the point I was trying to make was that being a single mother, with five small children, with no college degree, whose limited to working in a low wage, fast food job on her feet all day…..does anyone believe this is the type of person who has the time, energy, and knowledge to deal with MULTIPLE large, potentially dangerous, high drive dogs? Isn't this a classic recipe for disaster? The fact is, no ethical hobby breeder would sell this woman a dog. She would not have been able to get a dog from my dogs breeder, based on her profile. She would not have been able to get a dog from my local Golden Retriever Rescue, based on her profile. If she had Bentley since he was a puppy, he either came from some crappy back yard breeder, or some crazy rescue group. The killer dog Taz either came from a rescue group, or Mary Lane just got it off Craigslist or somewhere similar, and told people she "rescued" it. As far as I can see, if Mary Lane decided to "rescue" a stray pit bull, or get one off CL, and then exposed a strange child to a potentially dangerous dog, she is guilty of criminal negligence, or maybe even manslaughter. If, however, she got this dog from a "rescue group", who assured her that the dog "loved kids", was perfect for a low income single mother of five, then she may not be criminally negligent….she may be just another emotionally needy, unhappy woman with a lukewarm IQ who needs to keep having/acquiring more and more kids and dogs to fill whatever emotional void she has within her. I think where the dog came from matters in this investigation. 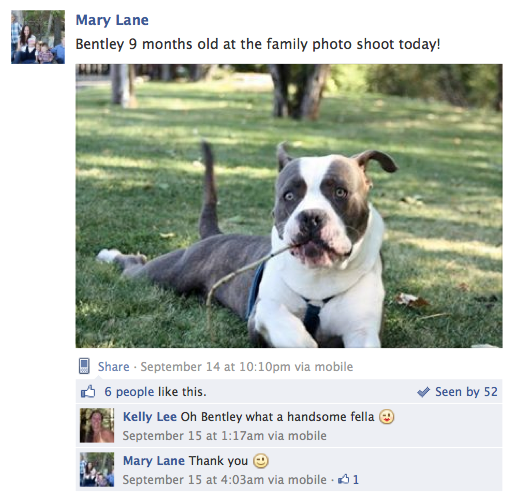 I also think that I would NOT trust Mary Lane, or her friends, assessment of her dog Bentley's temperament, since she has already caused the death of one child by misreading her recently acquired "rescue" dog, so anything she or her friends have to say about what a great dog Bentley is should be ignored. It's too late for Jordan Ryan, but maybe another child's life can be saved by better reporting of these fatal dog attacks. Maybe another parent will decide NOT to let their kids play at a house with a "rescued" pit bull. Maybe someone will come forward with information as to where the dog came from, so potential adopters can be warned NOT to adopt from that group. Here's another example, news clip from last Wednesday. This child survived the attack. The pit bull owner is facing charges, so she went to get payback on the pit bull rescue angel. In this instance, the word "rescue" is being misused. It's amazing that trafficking a dog for fighting is a felony, but trafficking a dog for killing a child is a non infraction. Meanwhile, the nutters protect the identities of these organizations like America's nuclear launch codes. Juries aren't insensitive, but they have to follow the law as the judge instructs it to them. The problem is in the laws that give vicious dogs too many chances and allow people to own these ambulatory grenades without bearing responsibility for what they've chosen. In the UK, the owner of the vicious pit bull type dogs that killed Jade Anderson (American Bulldog and so-called Am Staff type pit bulls) has also gotten away scot free. UK law doesn't consider attacks on private property a crime, not even if the dead person was an invited guest. The Crown Prosecutor tried to at least get a verdict of animal cruelty, even though that wasn't really why the pit bull type dogs killed. All this owner had done was do the kind of thing the pit nutters recommend (lockdown). She got off with a four month suspended sentence for that. The problem isn't in the justice system, at least not most of all. It's in our thoroughly corrupt lawmakers. In Jordan Ryan's case, it looks like there's also a problem with corrupt police departments that don't thoroughly investigate specifically pit bull type dog killings…because too many police officers (and/or their superiors?) are fans of pit bulls too. Good move that Dogsbite.org is submitting questions to put pressure on this cover-up system! That poor boy. This is just heartbreaking. It's the shows like Pit Boss and Dog Whisperer that fool people like Mary Lane into believing those dogs are safe and just "misunderstood". And then an innocent boy pays with his life, and hardly anyone seems to care. Lori, I am very sorry for your loss. It is an outrage that Mary Lane will pay a $500 fine, a slap on the wrist, rather than serve time in prison for manslaughter. I know your grieving family is outraged. I think the prosecutor should have done more, and the city council, too. They should be working day and night to get answers and get justice for him. Lori, I am so very, very sorry for the loss of your grandson. What I have come to realize is that the local media chose not to cover your grandson's death in a responsible manner. It doesn't appear that any of the several local media outlets reached out to the victims family; instead they appeared sympathetic to the dog owner. I think you should contact one of the local papers or news stations and see if they will do a follow up and let you speak your mind. It is absolutely outrageous that Mary Lane is taking public assistance and using it to feed her "rescued" pit bulls, instead of her children. She should have been charged with SOMETHING….child endangerment, manslaughter, etc. Instead she walks away with a modest fine. Don't stop speaking out, Lori, the prosecutor and city council should be ashamed. Keep your grandson's memory alive….he was an innocent child, murdered by a selfish pit bull owner, apparently with the blessing of local prosecutors. Don't let them forget what they have done to your family. One more though…. to Lori, if Mary Lane was on public assistance, I am guessing she was a renter? Have you and your family talked with a lawyer about suing the landlord for letting his tenant harbor dangerous dogs on the property? i am the cousin of this young boy that died i just turned 16 years old i was 13 when this happened and im still going through the griving stages. my aunt lori horn was and still is verrry upset and everyone is in the family i wish i was there cause if i was there that dog would be dead in my arms blood and all then the kid would be safe i would of died for him he he he had more to live than 5 years he had 90 more years on him. but life goes on and soon ill be playing with him and have some funnnnn.